The clay, for a start, has antiseptic qualities. It also maintains even temperature, cooling very, very slowly, which is good for keeping food hot after cooking in clay, or for incubation and slow cooling after reaching optimum culturing temperature in the yogurt-making process. Being unfired clay, it is also absorbent, so in yogurt-making it naturally absorbs extra moisture, making the yogurt more firm. It also adds a wonderful ‘earthy‘ flavour that is impossible to duplicate using any other medium. 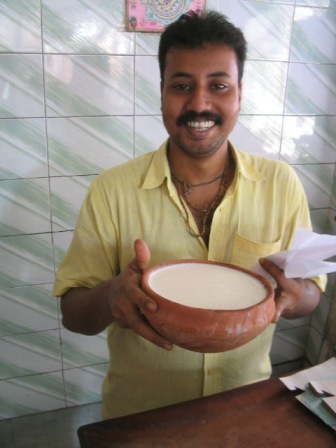 Yogurt, either plain or “mishti”, tastes wonderful from an earthenware pot. And of course, after one use only (they are never re-used) these pots are thrown into pits and allowed to break down back into the earth. So they’re 100% recyclable and environmentally friendly. Finally, earthenware pot-making is a thriving cottage industry in India, keeping hundreds of thousands employed. I’m sure there are other benefits, but this is what comes to mind.